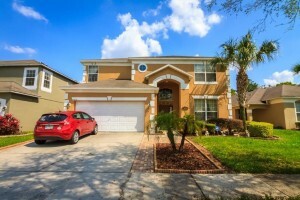 Orlando Vacation Home for sale in Prestigious Emerald Island. Gorgeous 7 bedroom 4.5 bathroom home fully furnished with large SW facing pool & spa overlooking conservation. This home is an investors dream, comes with a full calendar of bookings and future bookings potential. This home is in perfect condition With its South West facing pool for you sun seekers and the privacy of a conservation lot with no rear neighbors. Brand new kitchen appliances and granite countertops. Designer touches complete this furnished home along with luxury bedding, flat TV’s in every room. The spacious lounge has a 52 inch HDTV with cinema quality surround sound, DVD player and a variety of classic movies (250). A games room that provides you with endless entertainment such as a PS2 with 25 games, Wii with games, pool table, electronic dart board, air hockey table, TV, stereo, couch set. Walking distance to the clubhouse and only 4.5 miles to Disney. Everything has been added to this beautiful home to ensure that your guest will return. As you enter this prestigious gated Resort you will be greeted by beautiful gold dolphin fountains just before the amenity filled clubhouse! From the tennis and volleyball courts, communitypool, a play area and many trails for jogging/hiking, Emerald Island Resort has it all and is suitable for any age. Emerald Island Resort also offers a fitness room, sauna, steam room, and Jacuzzi. Don’t miss out on this opportunity! To set up your showing, or for more information on this home, email an@orlandovacationrealty.com or call 1(407)800-0888.